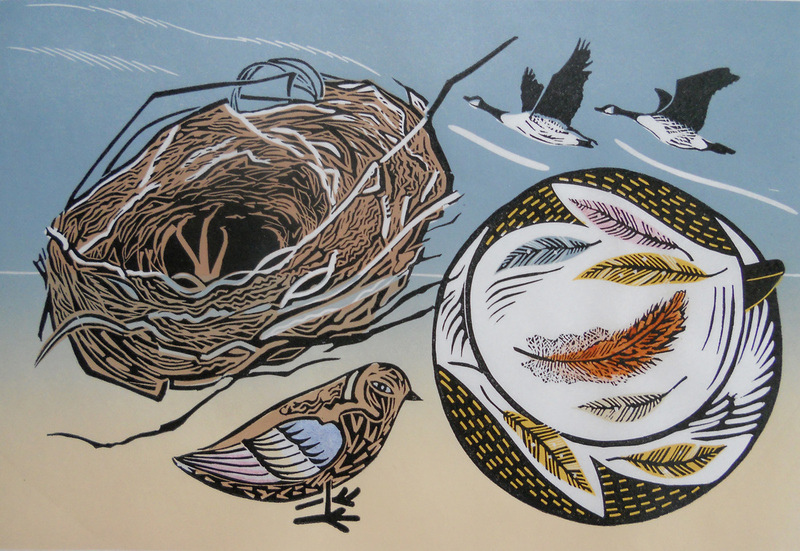 Linocuts, collagraphs, wood engravings, collages and handmade books on Hester and Pam's chosen theme of birds. 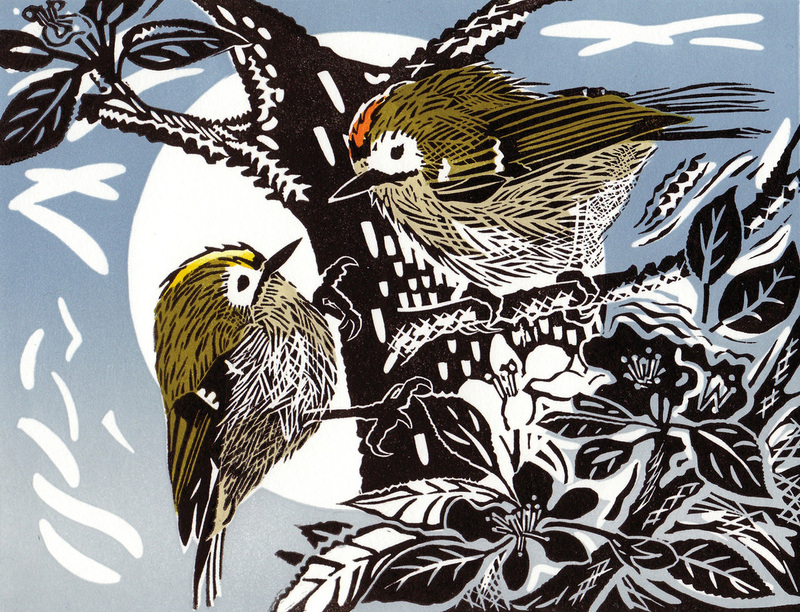 Hester Cox and Pam Grimmond are both printmakers living locally with national reputations as artists. Their collaboration on this exhibition is a really exciting one. 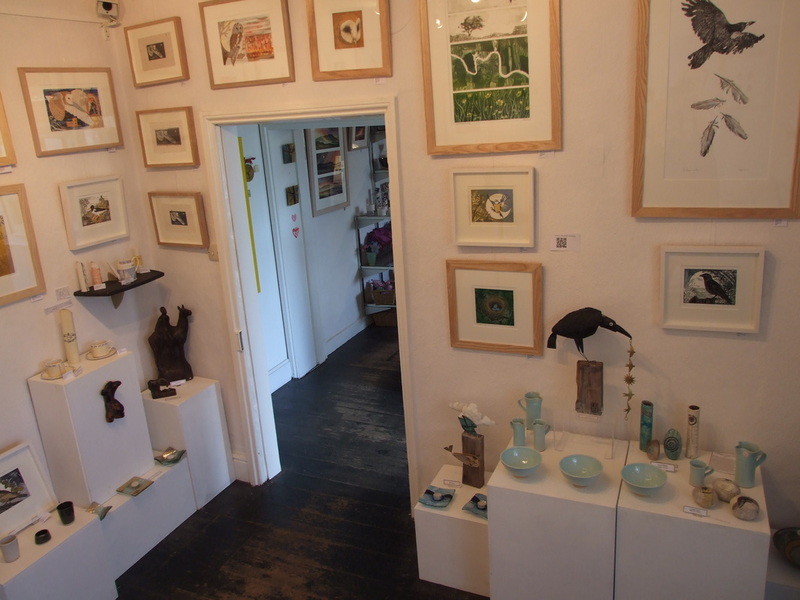 "Inspired by birds and nature in both the North Yorkshire countryside and the coastal areas of Northumberland, the exhibition theme ‘Of a Feather’ was an opportunity to portray my images in linocut, wood engraving and collage. 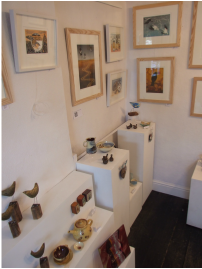 Attracted by the colours, movements and characters of birds, I observe their habits and environments and attempt to give a glimpse into their secret worlds. Still lives, which incorporate domestic items and crafted bird ornaments alongside feathers and nests, look out onto birds flying by, providing a tension between the stillness of the interior setting and the longing for freedom which birds embody. " "I've always gained considerable pleasure from the comings and goings of birds but as I grow older I find that I pay them more attention than ever before. Birds surround us and are evident pretty much at all times of day and some during the night too. If we can't see them, we can often hear their distinctive songs and calls. They evoke so many emotions and have inspired many an artist, writer and poet and so I suppose it isn't surprising that I've become somewhat obsessed with them. 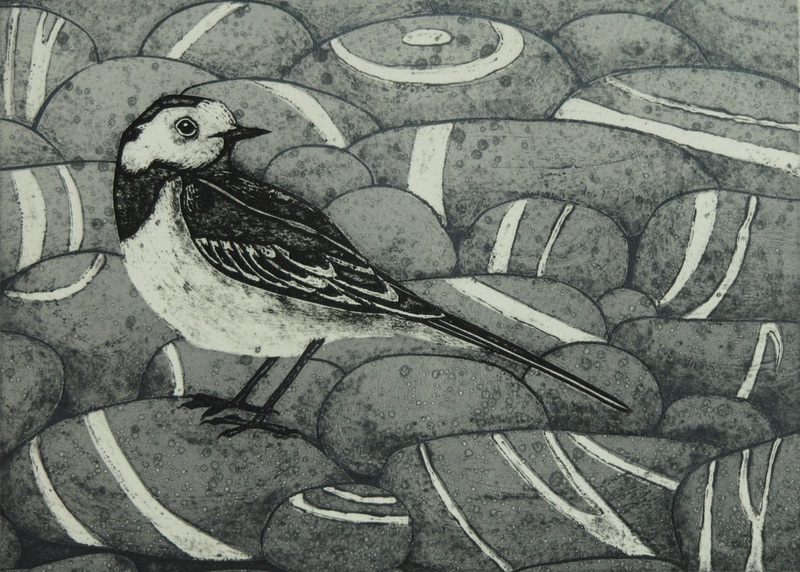 My prints are invariably inspired by something that I've seen and certain birds make repeat appearances. The crow family are not just striking in their appearance, they are also highly intelligent with often quirky habits and they have a wealth of myth and superstition attached to them. 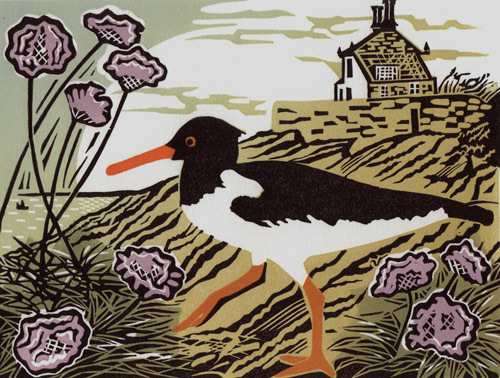 For me, curlews have become a magical bird. Their haunting burbling call and long curved beak make them unlike any other bird and I spend a lot of time watching them on the moors. I could easily spend hours watching the swallows feeding their young, collecting feathers from the hedgerows and listening to the rooks croaking in their nests. Discovering a clutch of perfect sky blue eggs has to be one of life's precious moments. 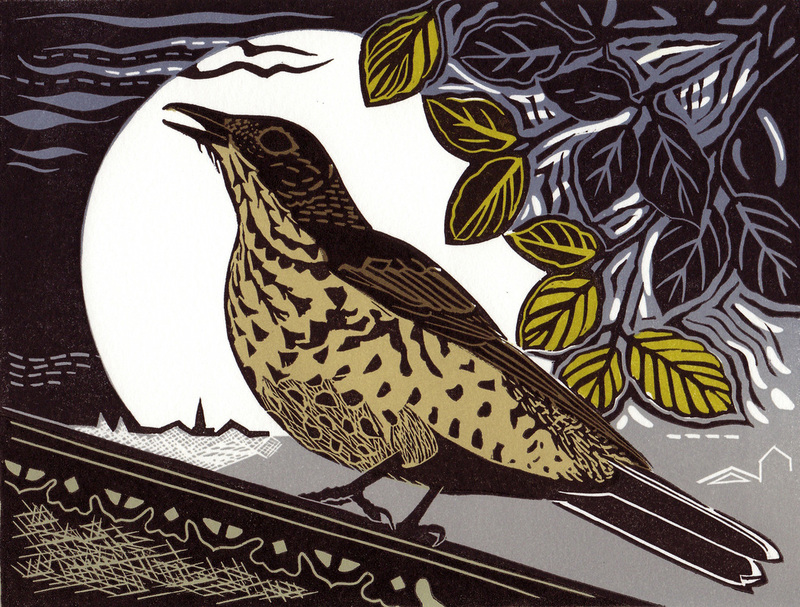 The habits of birds also help me to mark the turn of the seasons. So many of us associate the arrival of summer with when we see our first swallow return and feel wistful as they collect on the wires ready to depart in autumn but even the depths of winter are lifted by the song of a robin or a trail of bird footprints in the snow. Currently I am enjoying the sight of a family of cheeky blackbirds hopping about in my garden stealing the last of my raspberries. 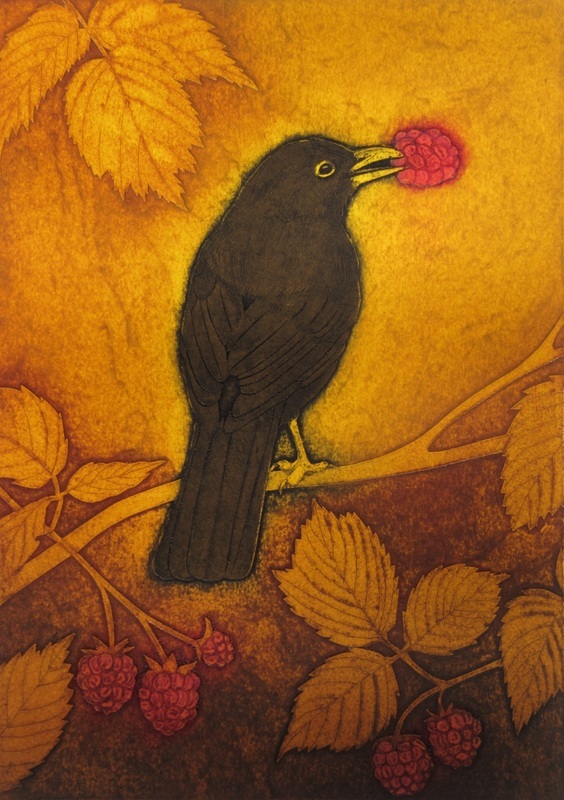 I enjoy watching them so much that I had to create a print to celebrate the fabulous vision of an ebony male with a succulent fruit crammed in his bright yellow beak. I love the fact that certain bird species carry ancient associations and there are still people that believe that birds carry the spirits of our ancestors. I hope that my prints celebrate some of the many facets of these beautiful creatures that are able to conquer land, water and sky"